A representative of the E.U., meanwhile, joined the chorus of criticism from international rights groups on the changes, saying in a statement that it was concerned the amendments placed further restrictions on the activities of political parties. The U.S. Embassy, which expressed “deep concerns” about an earlier set of changes to the law passed in February, declined to comment on Tuesday. The rubber-stamp Senate, which can only suggest changes to legislation, opted not to flex that muscle on Tuesday morning, with 42 CPP senators passing the amendments unanimously. 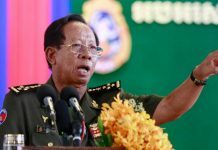 Mr. Eysan, the CPP spokesman, said the law would be sent to the Constitutional Council— which is stocked with CPP loyalists—this week, before being sent onward to King Norodom Sihamoni for his signature. 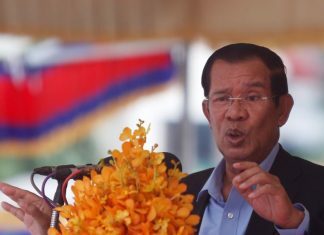 Teav Vannol, a senator and acting party president with the Sam Rainsy Party (SRP), said the party, like the CNRP when the National Assembly voted on the amendments, had sat out the vote because it narrowed the political space for Cambodian democracy. Senators vote to approve the latest amendments to the Law on Political Parties, in a photograph posted to the Senate’s Facebook page yesterday. 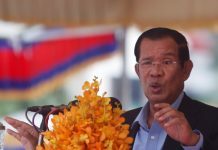 Ever since the SRP merged with opposition leader Kem Sokha’s Human Rights Party (HRP) in 2012, the two have continued to exist largely to preserve the opposition’s seats in commune councils and the Senate, which is chosen by the councils. To comply with the terms of the proposed law, which forbids parties from naming themselves after any individual or featuring anyone in their logo, the SRP will meet “soon” to finalize its new name, Mr. Vannol said. CNRP officials, meanwhile, on Monday began replacing tens of thousands of its signature signs and revising the party’s media content to comply with the proposed changes, according to CNRP lawmaker Mao Monyvann. 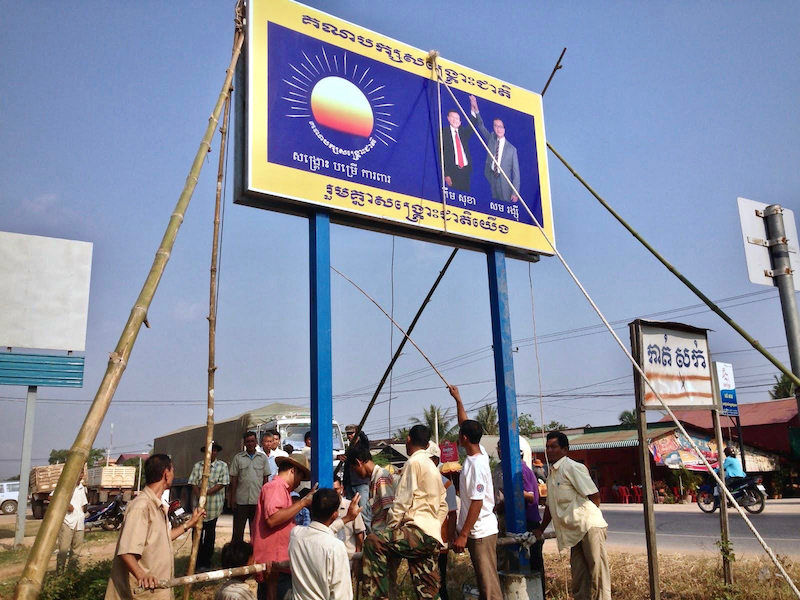 The new signs will feature only the party’s rising sun logo, Mr. Monyvann said, replacing images of Mr. Sokha, the current CNRP president, and Mr. Rainsy, who led the party until February’s set of amendments was passed, standing with raised, clasped hands. Provincial party offices will fund the effort and use stickers to cover up billboards, Mr. Monyvann said, adding that each village had at least one small sign and communes at least two to five larger signs that would need to be replaced. Supporters would still vote for the party without seeing its leaders as they traveled the country, he said. “The most important thing is to keep the party [intact], to join the election because we believe that we will win the 2018 national election,” he said. Royalist party Funcinpec will also have to revise its logo, which features Prince Norodom Ranariddh. Party spokesman Nhep Bunchin could not be reached for comment. Parties will have 90 days after the law goes into effect to comply with the new rules, according to the draft legislation.